The eldest Belcher child is a unique character in the world of modern television. And this is a very good thing. It's hardly surprising that Bob's Burgers has become one of the biggest recent successes in televised animation. It boasts a healthy mix of the usual qualifiers to success within its genre: A glib world-gone-mad sense of humor, a heavy focus on characters and situations defined by social awkwardness, acidic yet reliably Tumblr-friendly asides to a left-of-center worldview, a lead vocal-performance by John Benjamin and a near-absence of any names from the Cartoon Snob Blacklist (see: MacFarlane, Seth) on its creative team. 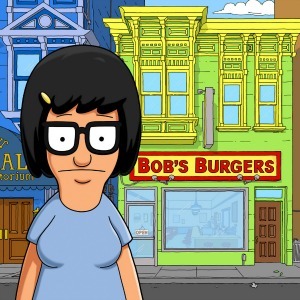 The whole family is hilarious, but the secret weapon of the Belcher family and of Bobs Burgers itself is the aforementioned eldest daughter, Tina. Because while the rest of the cast gamely improves on classic tropes of sitcoms past, Tina is something new entirely: There's never been a major character like her on the small-screen - her very presence in the "now" calling attention to a gaping void so many of us had likely overlooked before. This alleged Golden Age of television gets a lot of credit for confronting fears and horrors (think Hannibal, Walking Dead, American Horror Story.) But in a very real sense Tina's existence is a confrontation with something from which TV itself has always fled in terror: a teenaged girl grappling with adolescence... but on her terms, rather than as reacted-to by other (mostly male) characters.